In recent days we’ve had two articles – Giles Parkinson’s Coalition’s myth about renewables and high electricity prices at RenewEconomy and Ben Potter’s front page article for the AFR, published in print as Power crisis brings back fossil fuels. 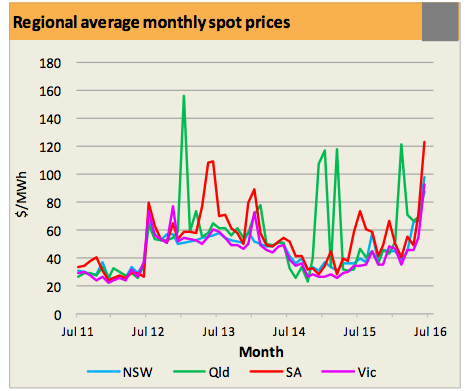 In July prices have averaged about $360MWh in SA so far this month, basically off the chart, compared to $80-90MWh in Victoria and NSW. At one point they hit the maximum price of $14,000MWh. Both articles agree that high gas prices, determined by the export market, have been a problem. The two most efficient gas power stations with the lowest emissions in the country have been closed down – Swanbank E in Queensland and Pelican Point in SA – because they became uneconomic from the high gas prices. Both articles agree that demand has been unexpectedly high, largely because of the cold weather. Moreover, SA is also waiting until July 25 for an enhanced connector to Victoria. As a consequence the SA Government has had to approach the owners of Pelican Point to crank it up again. Energy experts say South Australia’s heavy reliance on wind energy is compounding its problems in two ways, first by forcing the remaining baseload generators to earn more revenue in shorter periods of time when the wind isn’t blowing, and secondly by forcing baseload coal and gas generators out of the market altogether. But renewable energy advocates say the state’s plunge on wind power is not to blame, and the problems are a continuation of South Australia’s history of paying above average prices because of its isolation and concentration of its generation capacity. However when he looked at the relationship between wind generation and high wholesale electricity prices in two recent months in SA and Victoria, the two states with the most significant shares of wind generation in total supply, he found a strong inverse relationship between market price and wind generation is found. The higher the share of wind generation, the lower the price. That doesn’t completely answer the issues raised in Potter’s first quoted paragraph. A market that gets rid of more efficient gas but keeps cheaper coal is not what we want. In addressing this issue, the question of ‘baseload’ is a distraction. If networked over a large enough area incorporating different climatic conditions, baseload renewables, especially with solar storage for overnight, is a piece of cake. The problems are the marginal intermittency in supply, peaks in demand, and the flexible power or storage necessary to cope with a prolonged heat wave, cold snap or when the sun doesn’t shine for two weeks. Arguments that renewable energy isn’t up to the task because “the Sun doesn’t shine at night and the wind doesn’t blow all the time” are overly simplistic. There are a number of renewable energy technologies which can supply baseload power. The intermittency of other sources such as wind and solar photovoltaic can be addressed by interconnecting power plants which are widely geographically distributed, and by coupling them with peak-load plants such as gas turbines fueled by biofuels or natural gas which can quickly be switched on to fill in gaps of low wind or solar production. Numerous regional and global case studies – some incorporating modeling to demonstrate their feasibility – have provided plausible plans to meet 100% of energy demand with renewable sources. They don’t say how much peak load power will be needed, but a small percentage seems assumed, and for 100% the gas turbines have to be powered from renewable sources. Mark Diesendorf recently authored an article Dispelling the nuclear ‘baseload’ myth: nothing renewables can’t do better! first published at Ecologist, then at RenewEconomy. His main target initially was to blast the contention that nuclear is necessary to provide clean baseload power. Beyond that he surveys the same territory as the Skeptical Science piece. To summarise, looking at other plans, modelling and experience, around 80% renewable power seems eminently doable. Beyond that you may need flexible generation and/or storage at the margin, and he has ideas as to how these might be decarbonised. He does cite an American study that models 100% renewable energy supply in the USA, including transport and heat, using real wind and solar data over six years. You have to do it in your own patch, however, and pay for it. The north German states of Mecklenburg-Vorpommern and Schleswig-Holstein are already operating on 100% net renewable energy, mostly wind. The ‘net’ indicates trading with each other and their neighbours. However, we have to do it in Australia where we don’t have neighbours. Greg Hunt is using the present experience to take cheap political potshots, saying Labor wants high electricity prices. Christine Milne said, “We are now in the midst of a fight between the past and the future”. For the Coalition it seems the past is winning. It seems to me that the current system relies heavily on competition within freed-up markets. I doubt that will get us there, certainly not quickly enough. Labor’s climate change policy under the heading Cleaner Power Generation calls for a 12-month Electricity Modernisation Review working with the COAG Energy Council, NEM agencies, industry, unions and energy users. Sounds like a good idea, given that everyone is not necessarily already convinced of John D’s call for a government renewable auction scheme, like that in the ACT. Labor’s complementary electricity emissions trading scheme should be quietly put on the shelf to see what the review comes up with. There’s an extensive article on Intermittent energy source at Wikipedia. The Climate and Health Alliance did an analysis of the parties’ policies on climate change during the election and as you might expect, the coalition scored very low. As part of this I pored through Malcolm Turnbull’s main speeches and verbal statements during the election. I was pretty shocked to find that, while claiming to be committed to action on climate change, he also scare-mongered about the impact of renewable targets on electricity prices. That’s one of the reasons I’m feeling so depressed about the election results. More here from Ben Heard. Val, that’s a useful bit of research which holds Turnbull accountable, and confirms that he’s basically being programmed by the need to keep the Nats and his own right wing onside. A point that I meant to make is that having ‘dispatchable power’ to meet peaks and intermittency of supply needs to be paid for. A competitive market where only the power used is paid for doesn’t give any incentives to create the necessary reserve capacity. Hmm looks like I might have to amend the links to sources in my blog post – seems as if all Malcolm Turnbull’s speeches and verbal statements in the election have been taken off his website! I should have taken screen shots. But I’ve still got my notes with the details of what he said, when and where. Can’t hide, Mr Turnbull. The new ministry changes have combined energy and the environment under Josh Frydenberg. Has the potential to be just another weakening of the environmental dept but also has the potential to really drive the transition from fossil to renewable under someone who comes across as thoughtful and generally impressive. Hunt is being moved to Minister for Industry, Innovation and Science. Perhaps he will look less hunted now. When there is some question about whether a system has enough power to handle peaks it may be worth while setting up contracts for the supply of standby so that generators are ready to go if needed. I have argued for some time for standby contracts for fossil power can help ensure that the transition to 100% renewable goes smoothly. The risk of not having these contracts is that fossil power stations will go broke and shut down even though their capacity will be needed from time to time. SA was lucky that the Pelican Pt station hadn’t been shut down permanently. John I’ve done a new post on the ministerial changes. Conceptually the change to combine the environment and energy looks good, but there may be a wee problem in the man they chose. On standby power, it has to be paid for independently of how much it is used. I’d see making staying on the grid compulsory, and we all pay a service charge. I think we do have neighbours. At risk of being parochial, Victoria has neighbours in SA, Tas and NSW. Even ACT at a pinch. Doesn’t the national grid reflect that connectivity? Within Victoria, Wimmera and Mallee are neighbours, Melbourne and West Gippsland, etc. Ambigulous, I meant the Australian system covered by the NEM considered as one, which is all states and territories other than WA and NT, contrasting with the German states Mecklenburg-Vorpommern and Schleswig-Holstein which can exchange with their neighbours. Part of the problem is that the state bits are administered separately, as well as being set up on a free market competitive basis without vertical integration of production, distribution and sales. So acting rationally over the whole system to get the advantages of geographical diversity and then provide appropriate standby becomes a complex inter-institutional/political problem. It’s probably where we do less well than the EU with Brussels. Our free market based power marketing system seems to be producing high power costs because the price has to include compensation for uncertainty. Contracts to supply based on competitive tendering will tend to produce lower prices because of the reduced risk to investors. My worry, John, is that the ACT is a small part of the whole system and can change its power over to renewables without having an appreciable effect on the whole system. If Victoria were to adopt the same approach they’d have to be closing down brown coal. The dirty power producers are in private hands, and apart from lobbying, and the political problem of killing jobs in a region, presumably they would take the legal road if the state took action to destroy their market. There is no capacity on a national level to call tenders, because there is no institution that has that responsibility. Christine Milne was certainly dismissive of the problem of “stranded assets” and tended to say, bad luck, they made their choice at a time, they should have known better. I don’t think it will work that way in the real world. Brian: Most businesses have to live with their decisions. It is only a few “koala bears” like the power industry that believe someone else should pay for their poor decisions. Brian: If you recall some of my early writings on the subject I said that one of the key advantages of using contracts based on competitive tendering (auctions) was that it allowed governments to control what was built where and when. This means that you don’t get wind power concentrated at windy hill and energy storage can be included in the mix when appropriate. I haven’t got the link but Renew said that the latest Indian renewable energy auction had the successful bid coming in at 7 cents(Aus) per kWh. Problem is that such tendering would or could happen at state level, but we are really dealing with a national beast. Tony Wood, director of the Grattan Institute energy program, has a relevant opinion piece in the AFR. He refers to the COAG Energy Council (CEC), the national body of federal, state and territory energy ministers, as “dysfunctional”, but says the Australian Energy Market Commission has announced a review of the security of the system. due by Christmas I think. Wood sees Frydenburg as well-placed to take some action on co-ordinated planning. Certainly he’s well-paced in the new ministerial arrangements. BTW I understand only 14 enterprises ever paid the maximum price of $14,000MWh in SA. They were the ones who didn’t hedge their electricity prices and relied on spot prices. Renew economy offered this analysis re what actually happened in SA. Mr Frydenberg has called an urgent meeting of the COAG energy council next month to address growing concerns the problems from embedding wind and solar could extend to the eastern states. “The goal must be affordable, accessible and reliable energy supply as we transition to a lower emissions future,” Mr Frydenberg told The AFR Weekend.